French style napkin rings and table accessories from silver to French Country. Form and function come together beautifully with our splendidly designed napkin holder Ceramic salt and pepper shakers with beaded edges. 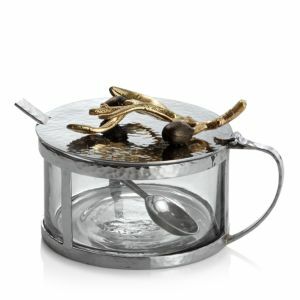 Scrolled, leafy metal stand with twisted handle. Complete your GG Collection "Fleur-de-Lis" flatware with this stunning three-piece hostess set that includes a fork and two spoons (one pierced). Oversized glass-covered butter dish, large enough for two sticks of butter or a block of cream cheese is from the GG Collection. Glass, ceramic and metal. Ornate dinnerware stand adds glamour to the buffet table while keeping the salad plates protected and organized. By GG Collection. We like this piece from the GG Collection for its looks as much as for its functionality. The two ceramic bowls rest in a metal stand and swivel so that the top one is covered by a metal lid and the bottom one sits flush so that the top container covers it. 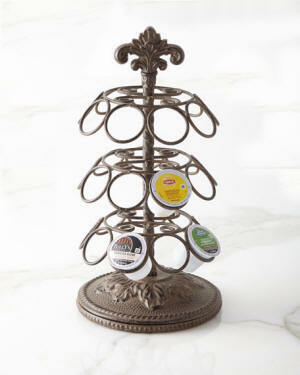 Handcrafted metal coffee pod holder. Holds 27 cups/pods. Handcrafted cream and sugar set. Tray, sweetener holder, and lid on sugar bowl made of natural mango wood with metal inlays. Sugar bowl and creamer made of glass; spoon made of metal. Hand finished. Caddy made of pierced aluminum with gold-tone plating; glass inserts. Glass liners are dishwasher safe. Made of pierced nickel-plated aluminum. Glass liners are dishwasher safe. Handcrafted set of two brass cheese knives. Handcrafted brass ice tongs. Handcrafted, sculpted brass salt and pepper shakers. Natural wood napkin holder with oxidized brass details. Wood natural & oxidized brass. Handcrafted trivet. Natural and oxidized bronze. Caddy made of nickel-plated, gold-tone, and oxidized metal; bottles made of glass and stainless steel. 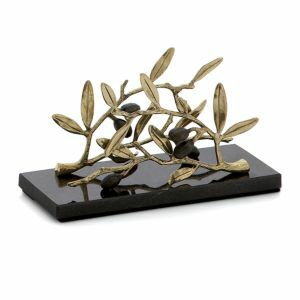 An evocative collection inspired by the natural world of foliage, Michael Aram's Olive Garden celebrates the poetics of the earth and its many textures and forms with fully functional creations that add artful touches to your fine home décor. Beautifully crafted and inspired by nature, the Olive Branch collection intricately reinterprets an iconic symbol of peace and goodwill with depth and beauty. Granite napkin holder with oxidized brass and 24-karat gold plated details. Brass and glass napkin rings. Napkin ring with embellished bug. Antiqued brass ring; zinc and epoxy stone. 24-karat gold plated napkin rings. Swarovski® crystal details. This is an amazing set of 4 jeweled napkin rings. The set is perfectly decorated with the nickel which sparkles and inspires glamour to your contemporary dining room. Our set of 4 jeweled napkin rings is made strong and durable from stainless steel material. Round concave clean styled napkin rings with beaded border to enhance the charm and formality of any table setting. Embellished bird napkin rings. Set of two. Brass/zinc/epoxy glass. The set is perfectly decorated with the gold finish which glitters and inspires glamour to the room. This exquisite kitchen piece of art is ideal for your interior decor. Our supreme quality product is top crafted and you are guaranteed of an incredible long-term easy to maintain and use. The set is perfectly decorated with the gold finish which glitters and inspires glamour to the room. This exquisite kitchen piece of art is ideal for your interior decor. Our supreme quality product is top crafted and you are guaranteed of an incredible long-term easy to maintain and use. The set is perfectly decorated with the gold finish which glitters and inspires glamour to the room. This exquisite kitchen piece of art is ideal for your interior decor. Our supreme quality product is top crafted and you are guaranteed of an incredible long-term easy to maintain and use. These Godinger multi purpose napkin ring/place card holders each have a different traditional ornament design for individuality. The Godinger Bamboo Design Napkin Rings offer a bamboo motif on the outside and clean design on the inner half, providing an oriental feel. This is an amazing set of 4 Silver Bird Design napkin rings. The set is perfectly decorated with the bird design which give our napkins its unique top design that you seek. These napkins are hand crafted from durable stainless-steel material that is rust free and very lasting. The Godinger LaVigna Napkin Rings offer a grape motif design with black stainless base and brass accented grapes, perfect for those wanting the formal wine drinking look. The Godinger Airplane Napkin Rings are for the host wants to add novelty and design to her table. The Godinger Arch Diamond Napkin Rings have a 3" concave standing metal holding a clear diamond stone, great for formal entertaining. The Godinger Hillcrest Napkin Rings offer alternative striped swirl lines on a clean styled shiny finish, great for casual and formal entertaining. The Godinger Copper Hammered Napkin Rings bright finish accent the table with additional copper serving pieces on display. The Godinger Diamond Band Napkin Ring provides an enhanced formal presentation, great for entertaining. Handcrafted ball-shaped salt and pepper shakers. Nickel-plated stainless steel. Handcrafted salt and pepper shakers. Heavy gauge hand-glazed steel under body. Hand-painted royal check decoration. Rimmed in bronzed stainless steel. Handcrafted salt and pepper shakers. Heavy gauge hand-glazed steel under body. Hand-painted royal check pattern. Blush Oro Bello charger plates. Beautifully hued blush glass with hand-painted 24-kt. gold detail. Handcrafted set of 4. Handcrafted glass dinner plates. Four-piece set. 24-karat gold accents painted by hand. Handcrafted charger plates. Glass with hand-painted 24-kt. gold decoration. Glass charger plate. Dona Jirafa charger plate. Beautifully detailed porcelain. Porcelain charger plate. 24-karat gold and platinum detail. These versatile chargers look lovely with any table setting. Use with candles to make a lovely centerpiece. Antiqued charger with raised beaded border. Charger plates handcrafted of aluminum. Finishes may vary. A magnificent set of 4 glass chargers with gold border. Give your occasion that bold look Hand-etched glass with 24-karat gold accenting. Handcrafted charger plate. Glazed on 12-gauge steel. Hand-painted design. Bronzed stainless steel rim.